In my family, August has always meant “back to school” time. Now that one of my daughters is in college and on the quarter system, she doesn’t start until September, but that doesn’t change the fact that August is still a great time to plan for the rest of the year. I think this is common for most families. People are back from their summer vacations and starting to plan their projects for the upcoming months. Whether it’s major car repairs, home remodeling jobs or health checkups they’ve been putting off, this is the time of year when people make the calls. 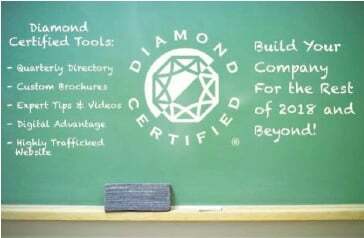 If you qualify for Diamond Certified, you’ll be in a unique position because you’ll have access to tools that make your company stand out from your competitors and help you capture the best consumers who will keep you busy through the typically slower months of the fall and winter. We know you probably have plenty of work at the moment, but it’s still important to make sure you’re ready for the last months of the year so you can ensure long-term retention of Quality Customers. Just as continuous studying is better than last-minute cramming for students, so is consistently using Diamond Certified tools for Diamond Certified companies. Diamond Certified Brochures: Your Highest in Quality and Helpful Expertise® reputation is reinforced every time you give out your custom Diamond Certified brochures and eBrochures. Diamond Certified Experts: Remember, 2018 is the year we’re bringing your Helpful Expertise® to more places than ever before. If you’re a Diamond Certified Expert Contributor, that means Quality Customers in your community see you more often as a local expert who cares. Diamond Certified Digital Advantage: The Diamond Certified Digital Advantage helps you build a better online presence while saving time and avoiding the fees charged by digital marketing agencies. We make your website faster, more secure, more visual and better loved by Google. Diamond Certified Homepage: Our newly redesigned website provides all the Deep Info potential customers need to choose your company. Your Diamond Certified Company Report is the best presentation of your company anywhere on the web because it provides prospects with accurate ratings, researched articles, a captivating video profile and photo gallery, and much more.